NEW ORLEANS – As hurricane floodwaters gushed into New Orleans, the 911 calls pouring in to police were desperate and, in a heartbreakingly Southern way, unfailingly polite. One woman thanked the operator for her time. Another apologized for calling so much. "I'm stuck in the attic, and me and my little sister are here, and my mom, and we've got water in our whole house," said a woman who was trapped with eight others in the low-income Ninth Ward, one of the hardest-hit areas of the city. "We don't have nothing to get out on the roof." "OK, ma'am, we're getting somebody out there ... OK?" replied the woman who identified herself as "Operator 1-6." "OK, thank you," the woman replied. "You're welcome," Operator 1-6 said in a comforting voice. The first hurricane-related 911 tapes released by New Orleans reflected the horror of Katrina, not so much in the panicked voices of the dying as in the calm and utter helplessness of victims with no escape. NEW ORLEANS — Cadaver dogs and boatloads of forensic workers fanned out Saturday across New Orleans to collect the corpses left behind by Hurricane Katrina. 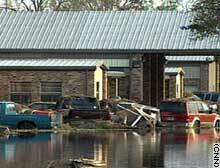 Cleanup crews towed away abandoned cars and even began readying a hotel for reopening. "Don't step in that blood - it's contaminated," he said. "That one with his arm sticking up in the air, he's an old man." Why would a 7-year-old girl have her throat cut? NEW ORLEANS, Louisiana (CNN) -- In a grim indicator of what may lie ahead, authorities were removing the remains of more than 30 people from a flooded nursing home in a suburban New Orleans parish. The discovery at St. Rita's Nursing Home in lower St. Bernard Parish came as 25,000 body bags arrived at the Louisiana Department of Health and Hospitals. Early Thursday, the official death toll along Gulf Coast from Hurricane Katrina stood at 294, but that number is expected to rise dramatically. NEW ORLEANS, Louisiana (CNN) -- Receding floodwaters in a suburban New Orleans parish revealed what many fear could be the first of many such discoveries -- more than 30 bodies in a nursing home that was swamped in Hurricane Katrina and its aftermath. St. Bernard Parish Sheriff Jack Stevens said "30-plus" bodies were found in St. Rita's Nursing Home in lower St. Bernard Parish -- one of the areas hardest hit by the storm and flooding. NEW ORLEANS | Medical specialists from Wright-Patterson Air Force feel like they are fighting a new war here. 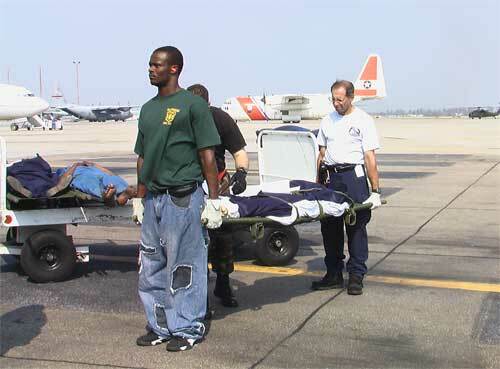 But instead of wounded troops, frail elderly people fill the stretchers, sometimes stacked four high, inside the 445th Airlift Wing transport jets that are flying daily missions to the Gulf Coast to evacuate medical patients from the devastation of Hurricane Katrina. Even the most seasoned medics have trouble absorbing what they find here, where patients lie on stretchers inside the terminal while throngs of bedraggled storm victims outside wait for help amid piles of garbage. "I've never seen anything like this," Senior Master Sgt. 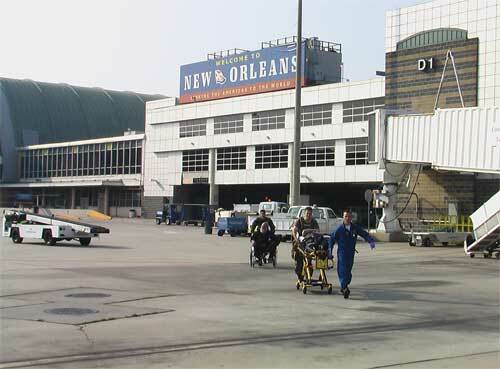 Terry Kennedy, said Saturday inside a noisy C-141 transport jet as it touched down in New Orleans. An Air Force Reservist with 26 years of service, Kennedy is an aeromedical evacuation technician who saw duty in both Persian Gulf wars. Saturday's mission was her second to New Orleans. Kennedy said she's used to planeloads of young men with battle wounds. She isn't used to racks of litters filled with elderly people, some dressed in nothing but diapers and paper gowns. "You want to wash them and bathe them and take care of them, and there's nothing you can do," she said. "We can't give medicine to these patients because we don't know ... the medical history or anything about these people. NEW ORLEANS — At the front of the line, the weary refugees waded through ankle-deep water, grabbed a bottle of water from state troopers and happily hopped on buses that would deliver them from the horrendous conditions of the Superdome. At the back end of the line, people jammed against police barricades in the rain. Refugees passed out and had to be lifted hand-over-hand overhead to medics. Pets were not allowed on the bus, and when a police officer confiscated a little boy's dog, the child cried until he vomited. "Snowball, snowball," he cried. 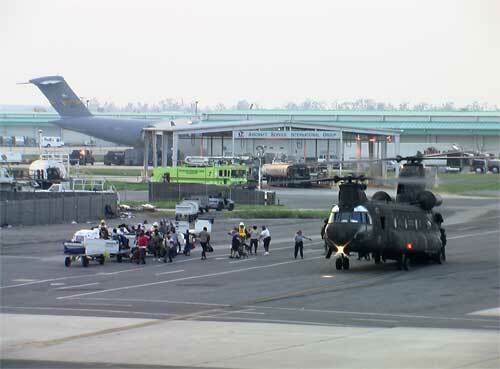 GULFPORT, MISSISSIPPI (AP) -- As dawn broke over the ravaged Gulf Coast Tuesday, rescuers in boats and helicopters furiously searched for possible survivors of Hurricane Katrina even as the governor said the death toll in just one Mississippi county could hit as high as 80. "The devastation down there is just enormous," Gov. Haley Barbour said Tuesday on NBC's "Today" show. Barbour said there were unconfirmed reports of up to 80 fatalities in Harrison County and the number was likely to rise. Throughout the day rescuers were using helicopters to drop lifelines to victims and pluck them from the roofs of homes cut off by floodwaters. The Coast Guard said it rescued some 1,200 people. But New Orleans Mayor Ray Nagin said thousands of people may still be stuck in rooftops and attics, so rescue boats were bypassing the dead.